Imagine your own PART TIME sewing machine repair business bringing in thousands each year! Sewing machines need to be serviced AT LEAST once per year or more if problems come up in the middle of a sewing project. Sewing machines in places of business (dry cleaners, hospitals, schools) need to be cleaned and adjusted QUARTERLY. When you consider the fact that there are 85 million or more sewing machines in homes today, not counting another ten million sewing machines in grade schools, high schools, colleges, dry cleaners, tailor shops, hospitals, major department stores, prisons, homes for children, correctional homes, there is a NEVER ENDING SUPPLY of sewing machines that need to be cleaned, adjusted, timed and repaired. "Sewing Machine Repair As A Home Business" teaches you EVERYTHING you need to know about how to repair sewing machines. We assume that you have had no previous experience in repairing sewing machines. However, if you have had some experience with sewing machines you will learn how to use your knowledge to your best advantage. Step by step instructions as well as hundreds of illustrations and diagrams show sewing machine parts, proper adjustments, cleaning, timing, changing and adjusting tensions. We teach you how to properly clean and lubricate machines; how to check out troubles such as needle breakage, skipped stitches, breaking thread, thread jamming in the bobbin; how to select the correct needle, plus much, much more. "Sewing Machine Repair As A Home Business" gives detailed information on how to start up and run this business as well as sample ads to run, customer information cards, how to charge customers, plus hints and tips on how to get customers, and sure fire methods of getting dozens of referrals from your customers! Also included is a listing of wholesalers where parts and sewing items can be purchased at wholesale cost. We teach you how to make additional sales after the repair job which can add HUNDREDS of dollars to the profits you're already enjoying. We suggest that you go to some yard sales or flea market and buy a cheap used sewing machine or two. These will be your "practice" machines. Following the instructions in "Sewing Machine Repair as a Home Business" you'll have these machines running smoothly in just a little while. And, don't forget, you can turn around and sell the machines you've repaired to make back the money you spent on them PLUS SOME PROFIT! TRAIN AT HOME! You don't have to quit your present job to get into the lucrative field of sewing machine repair. One or two evenings a week will get you in business in just a few weeks. A little more time spent in reading "Sewing Machine Repair as a Home Business" and working on your "practice" machines will get you out into the real world of sewing machine repair in just a couple of weeks! Work when YOU want to work! Ignore inflation! Command big money for your services! Easy to get started! Earn more part time than many people do working 40-60 hours a week! No special tools needed to do this tremendous business! As a sewing machine repairman for over 30 years, I have seen just about every type of sewing machine problem that there is. It is this 30 years of experience that I have put together in one clear, easy-to-read, easy-to-understand book that will get YOU started quickly in this "better than any other home based money-making business". 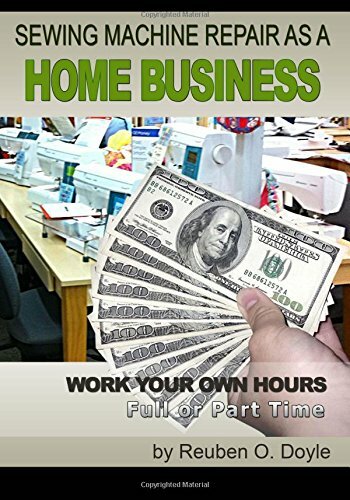 "Sewing Machine Repair as a Home Business" gives complete instructions on exactly how to repair a sewing machine and continues on through to how to advertise and market your services, plus it gives all the forms and samples needed to get in business quickly. "Sewing Machine Repair as a Home Business: · Gives step-by-step instructions on how to repair 90% of sewing machine problems. · No special tools required. · One simple test will fix over 25% of all repair jobs. · 10 point maintenance check list tells immediately what the problem is. · $50 to $100 per hour PROFIT.